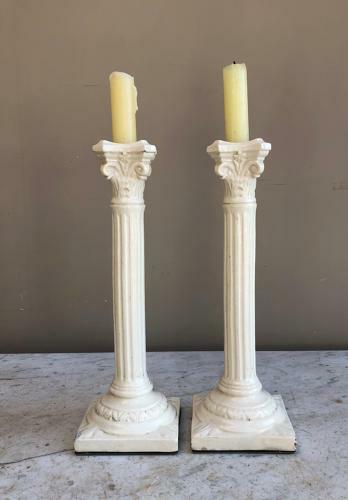 Always hard to find these candlesticks but especially nice to find a matched pair & a tall pair. Dating to the Early 20th Century they are white ironstone & shaped like columns on plinths. These have both been drilled & have been used as lamp bases....and can easily be rewired again or put a candle in as they were made to do & as my photographs. All over great condition...chip to one corner on one of the bases.